Comment: Normal wear and tear. Fact: Studies show that companies that have better alignment on their digital strategy, achieve better financial performance and customer retention, than their peers. Yet, less than HALF of surveyed C-Suite executives understand the role of DIGITAL ENGAGEMENT and have effective strategies in place. Some fear change. Some fear displacement. But most simply don't know how it actually generate ROI. If you are one of those, this book is for you. Anybody who wants to win the future must learn to build their personal and company brand with digital media. With compelling stories and expert guidance, Activate! provides a blueprint for online success. The book ACTIVATE! is a call to digital arms - and just what many business leaders need to win in today's evolving, competitive landscape in the Age of Digital. A true digital warrior and champion of established and emerging leaders, Gal Borenstein presents not just "what you need to know" but "why you need to do it now," in one quick read. 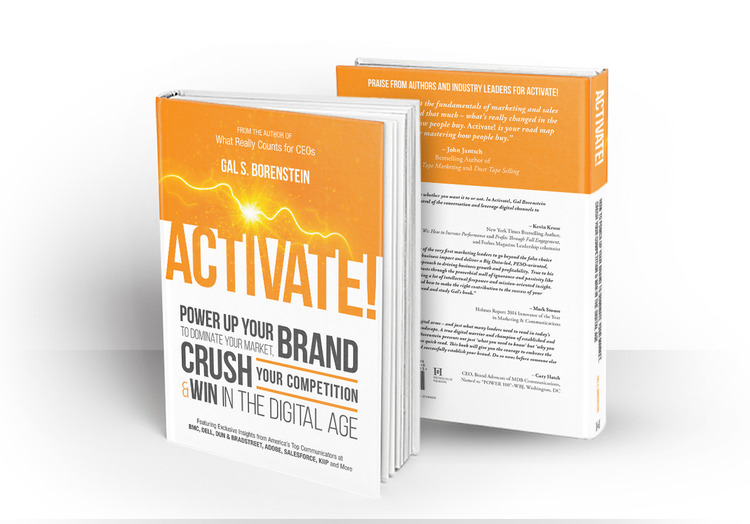 This book will give you the courage to embrace the digital groundswell and successfully establish your brand. Do so now; before someone else defines you! ACTIVATE! is written in plain english to help executives on Main Street gain a firm grasp on critical issues that impact their bottom line and growth, such as: Personal & Corporate Brand reputation, Digital Comms in today's Corporate Culture, Online Reputation Management, Social Media, Employer Branding, Marketing Intelligence & Automation, and Gamification. The book features exclusive insights from America's top communicators who were exclusively interviewed for this book by Gal Borenstein. Insights feature experts from DELL, DUN & BRADSTREET, ADOBE, SALESFORCE.COM, KIIP, CELERITY, CA TECHNOLOGIES AND BMC SOFTWARE. "Anybody who wants to win the future must learn to build their personal and company brand with digital media. With compelling stories and expert guidance, Activate provides a blueprint for online success." - Kevin Kruse, New York Times Bestselling Author, "We: How to Increase Performance and Profits Through Full Engagement," and Forbes Magazine Leadership columnist. "In ACTIVATE! you get the best of two worlds as Gal Borenstein fuses the unchanging best practices of traditional marketing with strategies specifically tailored to the ever-changing realities of the social media. Every page has practical brand-building ramifications." - Richard Levick is a communications thought leader and CEO of LEVICK, global strategic communications firm, and co-authored books including, The Communicators: Leadership in the Age of Crisis; and Stop the Presses: The Crisis and Litigation PR Desk Reference. Armed with the insight delivered by Gal Borenstein, you’ll be well equipped to effectively tackle what may be the most important issue confronting business leaders today. In Activate! 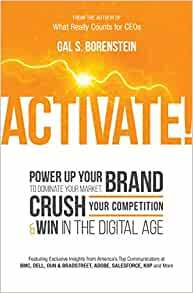 Power Up Your Brand To Dominate Your Market, Crush Your Competition And Win In The Digital Age, the author uncovers the long-pole issues that impact market leadership, customer growth and long-term profitability. While the title does not exactly roll off one’s tongue, it is accurate and the author delivers on his promise of actionable insight. - The author does not attempt to convey his sole perspective as an all-knowing marketing deity. Instead, he draws upon the expertise of several digital thought leaders and communicators, weaving their unique perspectives into the narrative. - The author reveals that many executives either avoid or passively delegate when confronted with the state of their organization’s “digital readiness.” The narrative addresses the enormous contrast between CEOs who pay lip service to engaging digital audiences and those who lead their organizations with effective digital strategies. - Throughout the book, Borenstein effectively defines issues critical to every enterprise by providing real-world case studies, entertaining anecdotes and relevant examples. These vignettes serve as the basis for actionable guidance and practical execution. A fast and enjoyable read, this is outstanding work that should be required in prep for leadership development programs or for executives planning offsite strategy sessions. Great book! Highly recommend it. When you want to learn about the art of war, you read Carl von Clausewitz, when you want the skinny on dreams you seek out Freud, and when you want the ultimate inside information about marketing and branding, you pick up a copy of “Activate!,” by Gal S. Borenstein, the guru of the art. The subtitle says it all: “Power Up Your Brand to Dominate Your Market, Crush Your Competition & Win in the Digital Age.” Borenstein, who heads the Borenstein Group, a major D.C. area marketing firm, explains – without the usual trite media jargon found in so many business-oriented books – how brands go wrong and marketing strategies fail and how to fix them with specific examples that make sense. David H.
Once again, respected marketing strategist Gal Borenstein delivers a clarion call to senior executives, marketers and other business leaders. As social media and other forms of digital engagement continue to proliferate -- permeating nearly ever facet of contemporary life -- Borenstein delivers an unabashed call for bold action and earnest engagement. Today, reputation management is a non-stop, real-time endeavor and no one embraces that reality more enthusiastically than Gal Borenstein. As always, his arguments are emphatic and persuasive. This is an important book -- really the first of its kind to make the mysteries and intricacies of digital engagement accessible to marcom traditionalists. If you're looking to make the leap from an ancestral to a digital marketing strategy, I can't think of a better blueprint. Read it now, and thank me later.